Reading and share top 19 famous quotes and sayings about Desire To Die by famous authors and people. Browse top 19 famous quotes and sayings about Desire To Die by most favorite authors. 1. "I nod, understanding. "You won't find any comfort in death." I promised her. "It's a void. It's nothing. You only want to die if you desire that nothingness, If you don't want to be alone, that means you're still alive. There's hope." 2. "He kissed her violently, wanting to somehow inhale her into himself, unable to stop the fury of his reaction, the trembling rocking hunger for her—so vast and all-encompassing, he couldn't stand it.Mattie, flowing all around him, met his savagery. He clasped her hips hard against him, found himself biting her neck, laving her breasts with his tongue. He felt such unblunted, furious desire he thought he might die of it." 3. "Those who have attained everlasting life in the vision of God doubtless know very well that it is no mere bribe, but the very consummation of their earthly discipleship; but we who have not yet attained it cannot know this in the same way, and cannot even begin to know it at all except by continuing to obey and finding the first reward of our obedience is our increasing power to desire the ultimate reward. Just in proportion as the desire grows, our fear lest it should be a mercenary desire will die away and finally be recognized as an absurdity. But probably this will not, for most of us, happen in a day; poetry replaces grammar, gospel replaces law, longing transforms obedience, as gradually as the tide lifts a grounded ship." 4. "Do what they will, then, we remain conscious of a desire which no natural happiness will satisfy. But is there any reason to suppose that reality offers any satisfaction to it? "Nor does the being hungry prove that we have bread." But I think it may be urged that this misses the point. A man's physical hunger does not prove that that man will get any bread; he may die of starvation on a raft in the Atlantic. But surely a man's hunger does prove that he comes of a race which repairs its body by eating and inhabits a world where eatable substances exist. In the same way, though I do not believe (I wish I did) that my desire for Paradise proves that I shall enjoy it, I think it a pretty good indication that such a thing exists and that some men will." 5. 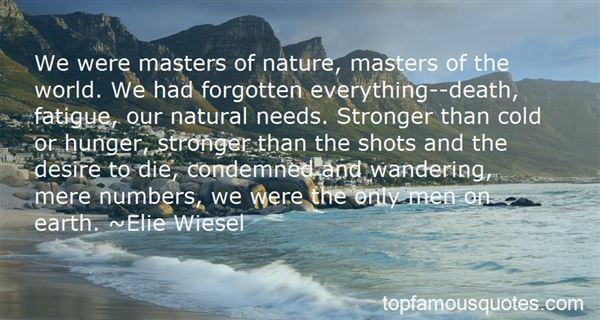 "We were masters of nature, masters of the world. We had forgotten everything--death, fatigue, our natural needs. Stronger than cold or hunger, stronger than the shots and the desire to die, condemned and wandering, mere numbers, we were the only men on earth." 6. 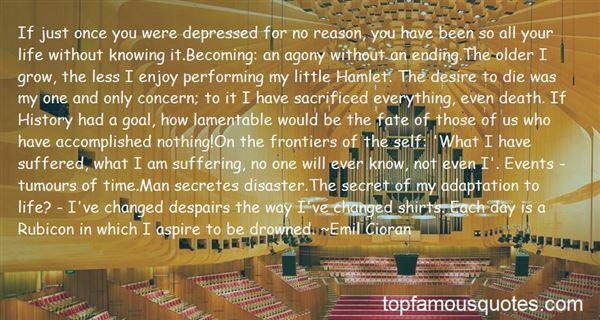 "If just once you were depressed for no reason, you have been so all your life without knowing it.Becoming: an agony without an ending.The older I grow, the less I enjoy performing my little Hamlet. The desire to die was my one and only concern; to it I have sacrificed everything, even death. If History had a goal, how lamentable would be the fate of those of us who have accomplished nothing!On the frontiers of the self: ‘What I have suffered, what I am suffering, no one will ever know, not even I'. Events - tumours of time.Man secretes disaster.The secret of my adaptation to life? - I've changed despairs the way I've changed shirts. Each day is a Rubicon in which I aspire to be drowned." 7. "We desire that God would give us the death-stroke; but we long to die without pain; we would die to our own will by the power of the will itself; we want to lose all and still hold all. Ah! what agony, what distress, when God has brought us to the end of our strength! We faint like a patient under a painful surgical operation. But the comparison is nought, for the object of the surgeon is to give us life -- that of God to make us die." 8. "Love is when the desire to be desired takes you so badly that you feel you could die of it." 9. "Why do we wear out so quickly, when the elements of which we are composed are indestructible? What is it that wears out? Not that of which we are made, that is certain. We wither and fade away, we perish, because the desire to live is extinguished. And why does this most potent flame die out? For lack of faith. From the time we are born we are told that we are mortal. From the time we are able to understand words we are taught that we must kill in order to survive. In season and out we are reminded that, no matter how intelligently, reasonably or wisely we live, we shall become sick and die. We are inoculated with the idea of death almost from birth. Is it any wonder that we die?" 10. "In my small way, I preserved and catalogued, and dipped into the vast ocean of learning that awaited, knowing all the time that the life of one man was insufficient for even the smallest part of the wonders that lay within. It is cruel that we are granted the desire to know, but denied the time to do so properly. We all die frustrated; it is the greatest lesson we have to learn." 11. "I cannot conceive of a greater loss than the loss of one's self-respect. Decedents of the beautiful women that fought so hard for centuries to be equal and not objects of men's will, only their achievement to die in vain. As today's woman single desire is to be any men's object by any means on her part. Talk about irony..."
12. "Maybe this is why I sleep only a few hours a month. I don't want to die again. This has become clearer and clearer to me recently, a desire so sharp and focused I can hardly believe it's mine: I don't want to die. I don't want to disappear. I want to stay." 13. "We are truth-speakers, we men of Gondor. We boast seldom, and then perform, or die in the attempt. "Not if I found it on the highway would I take it," I said. Even if I were such a man as to desire this thing, and even though I knew not clearly what this thing was when I spoke, still I should take those words as a vow, and be held by them." 14. "Tell a wise person, or else keep silent,because the mass man will mock it right away.I praise what is truly alive,what longs to be burned to death.In the calm water of the love-nights,where you were begotten, where you have begotten,a strange feeling comes over you,when you see the silent candle burning.Now you are no longer caughtin the obsession with darkness,and a desire for higher love-makingsweeps you upward.Distance does not make you falter.Now, arriving in magic, flying,and finally, insane for the light,you are the butterfly and you are gone.And so long as you haven't experienced this: to die and so to grow,you are only a troubled gueston the dark earth." 15. "Emma leaned over to where their faces were only inches apart. "Since you think you know everything, tell me if you understand this. Have you ever wanted something so bad you think you'd die if you don't have it? That the mere thought of it keeps you up at night. You can't sleep, you can't eat, you can't drink. You are so consumed by that desire nothing else matters, and you're not sure life is worth living if you can't have it." 16. "We take pictures because we can't accept that everything passes, we can't accept that the repetition of a moment is an impossibility. We wage a monotonous war against our own impending deaths, against time that turns children into that other, lesser species: adults. We take pictures because we know we will forget. We will forget the week, the day, the hour. We will forget when we were happiest. We take pictures out of pride, a desire to have the best of ourselve preserved. We fear that we will die and others will not know we lived." 17. "Truth usually makes no sense. If your desire is for everything to make perfect sense, then you should take refuge in fiction. In fiction, all threads tie together in a neat bow and everything moves smoothly from one point to the next to the next. In real life, though... nothing makes sense. Bad things happen to good people. The pious die young while the wicked live until old age. War, famine, pestilence, death all occur randomly and senselessly and leave us more often than not scratching our heads and hurling the question 'why?' into a void that provides no answers." 18. 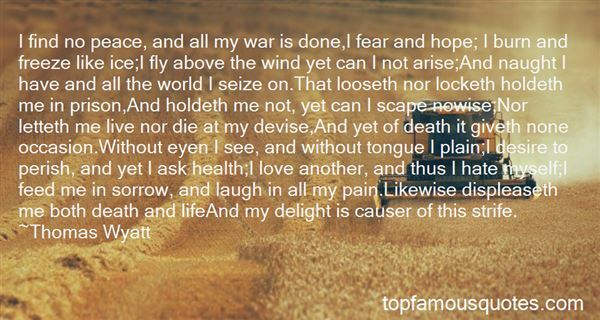 "I find no peace, and all my war is done,I fear and hope; I burn and freeze like ice;I fly above the wind yet can I not arise;And naught I have and all the world I seize on.That looseth nor locketh holdeth me in prison,And holdeth me not, yet can I scape nowise;Nor letteth me live nor die at my devise,And yet of death it giveth none occasion.Without eyen I see, and without tongue I plain;I desire to perish, and yet I ask health;I love another, and thus I hate myself;I feed me in sorrow, and laugh in all my pain.Likewise displeaseth me both death and lifeAnd my delight is causer of this strife." 19. "The very instant I saw you, didMy heart fly to your service; there residesTo make me slave to it....mine unworthiness, that dare not offerWhat I desire to give, and much less takeWhat I shall die to want." If you wish to be happy,Eragon, Think not of what is to come nor of that which you have no control over but rather of the now and that which you are able to change" ~Oromis to eragon ,Brisingr~618"